Ethelo provides another tool in the public engagement toolbox. Like many cities and towns across Canada, Okotoks — a town of about 30,000 in southern Alberta — is increasing civic engagement with its residents. Public consultation takes many forms, including online surveys and in-person meetings. For its Environmental Master Plan, the Town was specifically looking to engage with younger residents and families. This group can be difficult to reach through other means because of responsibilities and long commute times into Calgary. Okotoks Communications Specialist Marni Hutchinson said the Town chose Ethelo because it combined the dialogue of face-to-face engagement with the convenience of an online platform. Administrators also liked that participants could see feedback in real-time, rather than waiting until the results of a survey or focus group were released. Residents received information on multiple solutions in each area and asked how much they supported each one. All of the information was deliberately high level, as the goal of the consultation was not to seek input on the feasibility of implementing any of the proposed initiatives. 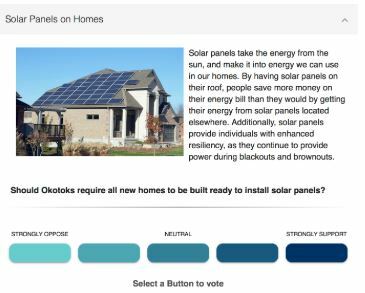 From there, participants ranked each topic on a scale of importance, and then Ethelo’s algorithm used those rankings to create a final list of the proposed changes that had the broadest level of support. Many of the topics received more than 75 percent approval — suggesting that there was a clear consensus on some of the items to include in the Environmental Master Plan. In addition, most of the options received a dozen or more comments that showed a lively discussion among people with varying points of view. 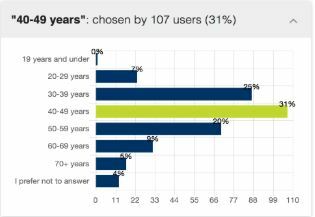 More than half of respondents were ages 30-49, suggesting that Okotoks reached the demographic it was intending by using Ethelo. The consultation also provided an opportunity for residents to suggest new ideas, like a bike share. This came up several times and is now part of the Environmental Master Plan. Now that Okotoks are familiar with how Ethelo works, they look forward to making the next consultation even better. Botkin said she sees Ethelo being particularly helpful in illustrating the budgetary constraints that the Town faces in trying to meet residents’ requests. The public engagement phase of the Environmental Master Plan has ended, and the plan is now being finalized. The implementation phase is expected to begin in 2019. 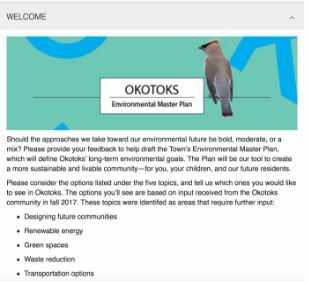 Read our CASE STUDY on the Okotoks Environmental Master Plan project for more detailed results and analysis of Ethelo’s partnership with the Town of Okotoks.